I promise I don't always wear that hat… well I do wear it quite a lot to be honest! But y'know, its almost winter so thats my excuse! Glamourous have bought out some new Disco Pants that are actually black, you can see my review of their other disco pants dupes here. I much prefer these ones even though the Charcoal ones are pretty nice. I find the colour alot easier to wear as it is a true black, which is similar to the Originals. My style isn't really all that exciting at the moment as I hardly bought any clothes with me when I moved back so I just sort of wear variations of the same outfit! I can't wait to get my mitts on my full wardrobe again and actually be able to go on a little shopping spree! I'm still feeling like an idiot posing near my house bribing my brother with a lift to his friends to take my photos! Oh well! I love your hat and shirt!! Oh i really like that jacket! Shame it's sold out! I really like this outfit, your blog is amazing. I love how you lay out all of your images, how do you do it? If you get the chance please visit my blog :) Im a newbie. 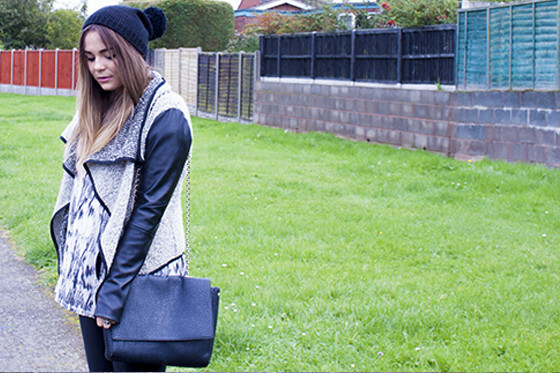 In love with this outfit, I'm so excited to be able to layer up, yay for autumn! I like the outfit, but ,above all, I love the hat! Haha. I love that you had to bribe your brother to take your photos. It is such a pain isn't it. These bloggers who have photographers with them all the time. How do they do it. I love your Zara bag. I've been eyeing up these black disco pant dupes too... they're so much nicer than the charcoal ones! So pleased to see you back - this is a lovely outfit! i like your new photos especially for winter. love the hat & jackets. That's what little brothers are for, haha. so super cute and looks so cozy, perfect outfit for autumn! love the bag and coat. Theis version of the Glamorous disco pants looks a lot better. Still trying to decide whether or not I like the first copies or not! I love the illusion of layers from your jacket. And it does seem to keep you warm for your upcoming winter! I like the hat anyway. Lily, I could kiss you! I bought the old glamourous disco pants and I haven't worn them once, the colouring just wasn't right. I wouldn't have known that they actually had decent black ones, if I hadn't have seen this post! They are now officially ordered! i looove that jacket. 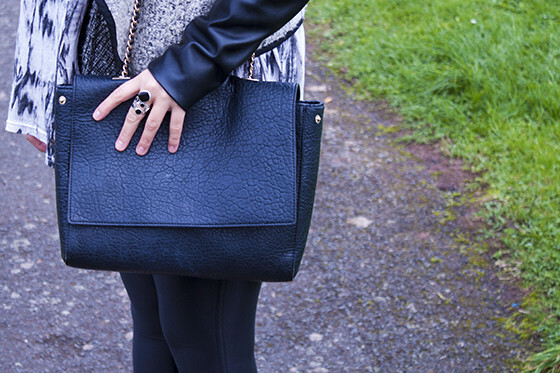 Leather and draping works so well together! You look lovely :) I love the hat! love new pictures in the outside. Kisses from south america lily! I'm totally in love with your jacket - Unfortunately sold out -.- But it looks amazing. 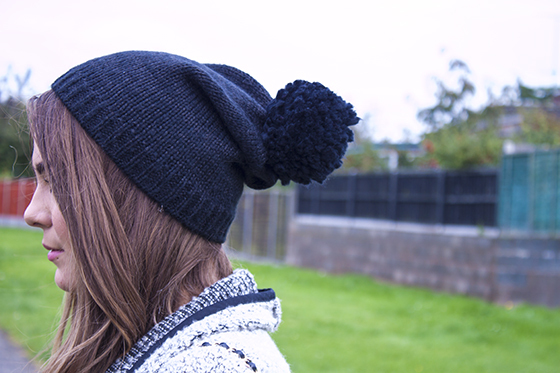 Love the pompom hat! I really do rather like those leggings... They look very subtle compared to other disco pants I've seen. I absolutely love your jacket! I can see why it's sold out! I'm also liking the look of these disco pants. 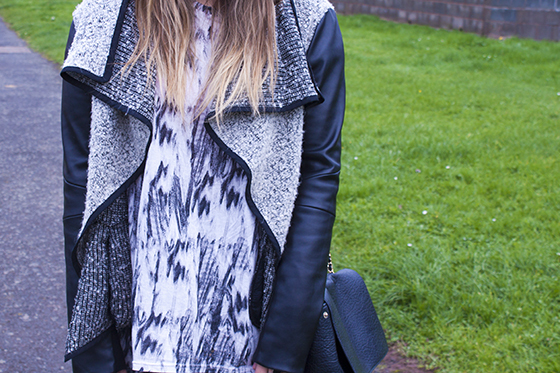 This jacket is back in stock on ASOS! I really like this new format for outfit pictures! I hope you find someone to take some shots when you're back in Landaaaan! The hat is adorable too!!! I love the pictures! Is your bag from http://wagworld.co.uk? Love this jacket, can understand why its sold out! Love your style!!! Nice jacket!! This sweatshirt is gorgeous! Does it do okay in the washing machine? I love refashioning sweatshirts to make them a little more sophisticated, so I'll have to try this sometime. :) Thanks for the inspiration! Lovely outfit, the bag is so cute ! Really a wonderful outfit. I looooove your jacket and a bag. Thanks for the post. I am loving all your outdoor shots! Keep doing more of those! Nice outfit! She is stylish for winter.